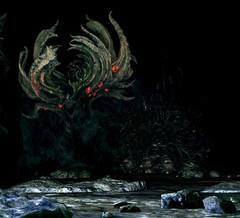 While something of a demon in appearance when encountered by the player, Manus was in fact once human. He became the Father of the Abyss when his humanity went wild, but it is not known what caused this. According to both Marvellous Chester and Hawkeye Gough, an unidentified Primordial Serpent (whether it was Kaathe or Frampt is uncertain) urged the citizens of Oolacile to delve in the dark of the Abyss, where they awoke this primordial man. Upon awakening, he raged and set to expand his domain while seeking out his precious Broken Pendant. His influence consumed the citizens of Oolacile, whose humanity went wild in turn, mutating them into ghastly creatures. Its inhabitants gone mad, Oolacile was left to fall to ruin. Nothing remains in present day to mark the passing of Oolacile, save Dusk. When the player finds half of his pendant, Manus reaches out through time and space to reacquire it, taking the player to Oolacile in the process. He also takes Marvellous Chester in the same manner, who may have found the other half of the pendant in another time. While this pendant obviously held some deep meaning to Manus, but it is long since lost to time. Sometime before the player's arrival into the past, Artorias and his young wolf Sif faced off against Manus. However, Manus overpowered them. Artorias sacrificed himself to protect his compatriot. Manus, having defeated Artorias, corrupted him against his will. After his defeat, his soul split apart and became fragmented. Eventually some of these soul fragments became self-aware and formed into their own entities. 'Manus' is the Latin word for 'hand'. Additionally, Manu is a term found with various meanings in different mythologies of Hinduism. In early texts, it refers to the archetypal man, or to the first man, progenitor of humanity. In later texts, Manu is the title or name of the head of mythical dynasties that begin with each cyclic aeon when the universe is born anew. Deep in the dungeons below Oolacile where it would seem the townsfolk tortured various humans. Broken-through cells can be found with chains dangling from the ceiling. One such tortured soul is found at the entrance of it, who seems to have been mounted and chained to a pole. Dark of the Abyss, which swallowed poor Artorias, threatens to devour our entire land of Oolacile. It seems that this dire fate is unavoidable. But, seduced by a Dark serpent or no, they awoke that thing themselves, and drove it mad. …One's demise is always one's own making. 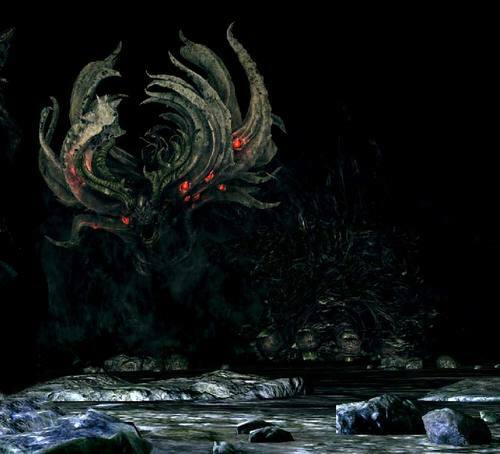 If thine wish is to succeed poor Artorias, and challenge the spread of the Dark, Then thou must face Manus, Father of the Abyss. The Dark emanates from Manus himself. Even if this land shall expire, thou may be able to prevent further corrosion. Thy Scent is very human, indeed. …But, not intolerable… But Princess Dusk is here no longer… snatched away by that horrifying primeval human. Believe it or not… Oolacile has brought the Abyss upon itself. Fooled by that toothy serpent, they upturned the grave of primeval man, and incited his ornery wrath. What could they have been thinking? Dark Fog: Abyss sorcery discovered by an Oolacile sorcerer on the brink of madness. Although Dark Fog is, in theory, relatively close to humanity, it also happens to be a terrible poison for humans. Perhaps it reflects man's cruelty against his own. Soul of Manus: This extraordinary soul is a viscous, lukewarm lump of gentle humanity. Ancient Manus was clearly once human. But he became the Father of the Abyss after his humanity went wild, eternally seeking his precious broken pendant. I still think on that creature from the Abyss that preyed upon me. My faculties were far from lucid, but I quite clearly sensed certain emotions. A wrenching nostalgia, a lost joy, an object of obsession, and a sincere hope to reclaim it… Could these thoughts belong to the beast from the Abyss? But if that were true, then perhaps it is no beast after all? Pursuers: Sorcery of Manus, Father of the Abyss. Grant a fleeting will to the Dark of humanity, and volley the result. The will feels envy, or perhaps love, and despite the inevitably trite and tragic ending, the will sees no alternative, and is driven madly toward its target. After the advent of fire, the ancient lords found the three souls. But your progenitor found a fourth, unique soul. The Dark Soul. Your ancestor claimed the Dark Soul and waited for Fire to subside. And soon, the flames did fade, and only Dark remained. Thus began the age of men, the Age of Dark. During the Game no Shokutaku interview with Miyazaki, he said: "The image is something like a human ancestor. It found the Lord Soul and humanity is like a fragment of it. Kinda like an ancestor, so the descendants have a part of that soul/"
A sorcery catalyst born from the soul of Manus, Father of the Abyss. A rough, old wooden catalyst large enough to be used as a strike weapon.